Paints, stains and finishes protect materials and add beauty to building exteriors. Here’s a guide to choosing products that are beautifully sustainable, too. WE EXPECT a lot out of the coatings that protect siding, trim and other parts of a building exterior. Paints, stains and finishes must be resistant to moisture, mold and the constant exposure to UV radiation. And of course they must add beauty to the materials. Modern chemistry allows coatings to perform, but not without costs. Most paints and finishes are high in embodied energy, and since home exteriors are repainted frequently—on average, every five to 10 years—coatings can add significantly to a building’s carbon footprint. Consequently, choosing a durable product, proper application and maintenance are imperative. Many coatings contain volatile organic compounds (VOCs) and toxic chemicals that threaten the health of workers in manufacturing facilities, contractors applying the materials and people exposed to them inside or outside of buildings. Architectural coating products also present a disposal problem. Fortunately, the industry has undergone a transformation in recent decades. The first big change was the phase-out of lead pigments, banned in 1978. The industry has moved away from oil-based solvents; today, the vast majority of all architectural coatings are water based. These contain a fraction of the VOCs and much lower embodied energy. For exterior renovations, cover the ground and, in some instances, erect vertical containment or equivalent extra precautions in containing the work area. Sanding, grinding, planing, needle gunning or blasting with power tools and equipment not equipped with a shroud and HEPA vacuum attachment. Using a heat gun at temperatures greater than 1,100 °F. Methods that reduce dust include using water to mist areas before sanding or scraping, scoring paint before separating components and prying and pulling apart components instead of breaking them. 3. Clean up thoroughly. The area must be cleaned up daily using special cleaning methods before taking down any plastic that isolates the work area from the rest of the home. Use a HEPA vacuum to clean up dust and debris on all surfaces. Wet wipe and wet mop with plenty of rinse water. There should be no dust, paint chips or debris in the work area; otherwise, the area must be re-cleaned. As the word implies, binders help hold the pigments together. 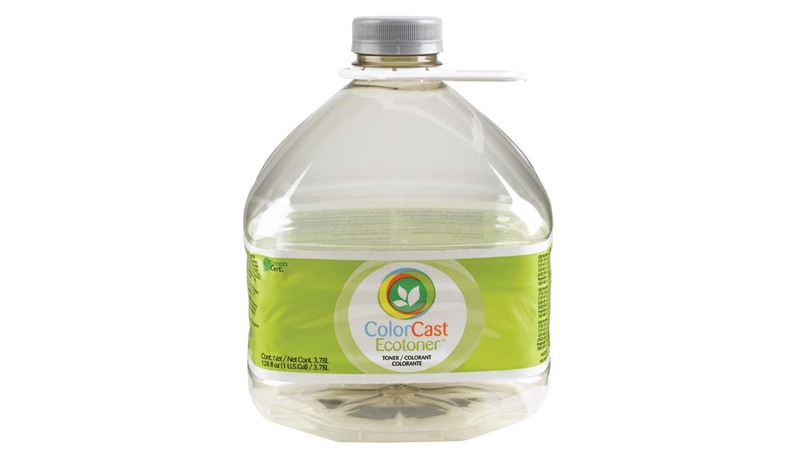 Most high-end water-based paints contain synthetic acrylic resins as the binder. These paints perform extremely well, and although acrylic resins are made from petroleum, water-based paints—also called “latex-based” paints—don’t have the same environmental issues as those that use oil as a solvent, which can be a significant source of VOCs in coatings. Additives include biocides, fungicides and agents which enhance performance. Heavy metals such as cadmium are used as drying agents. Some of the problem VOCs found in conventional paints include formaldehyde, benzene, acetone, cyclohexane and xylene. Not only are these compounds harmful to health, they accrue in the atmosphere, adding to the greenhouse effect. The EPA limits VOC concentrations in architectural coatings; for instance, the limit for exterior coatings is 380 grams per liter (g/L); the limit for clear and semitransparent stains is 550 g/L. Some states, regions and counties have set even stricter standards; for example, South Coast Air Quality Management District (SCAQMD), the air pollution control agency for the Los Angeles area, limits VOC levels in architectural coatings to 50 g/L. Several manufacturers offer formulations that meet or exceed even the strictest limits; however, it’s important to understand that colorants often contain VOCs and so add to the total concentration of the mixed product. In addition, some low- or no-VOC products may still contain toxic substances. The best way to evaluate a coating is to download the product’s Material Safety Data Sheet (MSDS). Manufacturers are required to list potentially hazardous ingredients. Product Data Sheets (PDS) will include VOC concentration, solid content and other information that can help you evaluate the product’s quality. Products that have been certified by third-party organizations are required to meet standards limiting VOC concentration or emissions and, in some cases, chemicals of concern (see Certification Guide on page 54). In general, there is movement toward less toxic formulations and low- or no-VOC formulations, says Steve Dearborn, president of Miller Paint, which is based in Portland, Oregon, and serves the Pacific Northwest. “It’s now possible to put together a completely nontoxic product,” he says. Not surprisingly, there are far more nontoxic and low- and no-VOC options for interiors than for exteriors. Concern for indoor air quality has driven the demand of these healthier interior products, but the contribution of coatings to greenhouse gas emissions is behind much of the legislation mandating coatings with lower VOCs. Choosing a responsible exterior product requires balancing performance (i.e., durability) and environmental considerations. However, manufacturers that have already developed low- and no-VOC interior products are now taking up the challenge outside of the building. Imperial Paints, based in the U.K., saw so much interest in its “all natural” paint products that it opened a manufacturing facility in South Carolina. 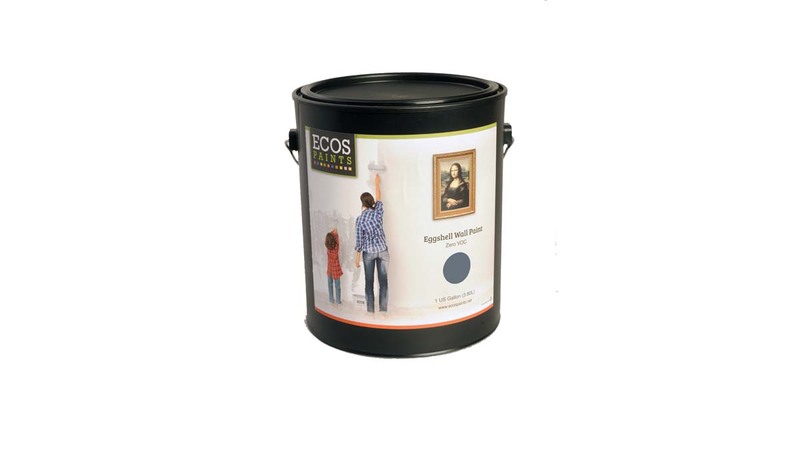 The daughter company, called ECOS Paints, offers organic and 100 percent VOC-free nontoxic paint to online customers. “The original formulation was developed by a British chemist who suffered from Chronic Fatigue Syndrome,” says Danny Holder, technical sales manager for ECOS Paints. “He developed a product line that was pure before it was fashionable to do so.” At first, the paints were sold mostly to asthma and allergy sufferers, but as people became concerned and about harmful chemicals, sales increased. The colorants for ECOS paints are imported from Europe. Many are medical and dental grade; some are even food and cosmetic grade. There are no glycols, a common source of VOCs in paints. A gallon of eggshell paint costs $54, and shipping can add substantially to the cost; however, a recent partnership with UPS has created an affordable alternative. Any order may be picked up at a UPS store location for only $9.95, regardless of distance or size of the order. Mythic Paint developed its no-VOC, carcinogen-free formulation in collaboration with the University of Southern Mississippi through a government grant. 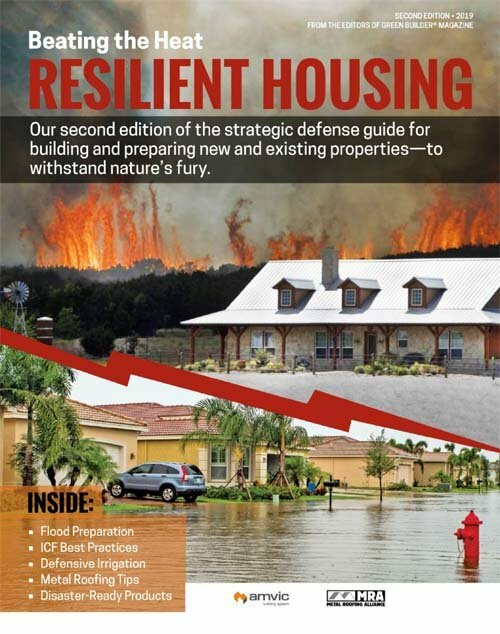 “At the time, the Pentagon was looking for paint which would not require them to relocate their personnel during renovations,” says Sabrina Kleinknecht, corporate account executive for Mythic Paint. Every product qualifies as zero-VOC, even with colorants, which are made with both natural and man-made materials. Zinc oxide serves as the fungicide and is preferable to the more toxic alternatives. 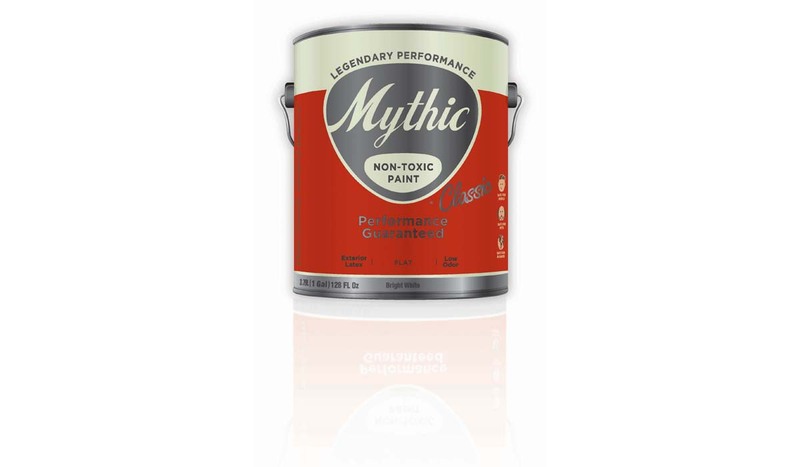 Mythic Paint offers 100 percent acrylic exterior paints at a competitive price point (its Classic low-lustre is $39.99/gallon). Several companies now offer VOC-free colorants, including Mythic, Miller Paint, Dunn-Edwards and Sherwin-Williams. 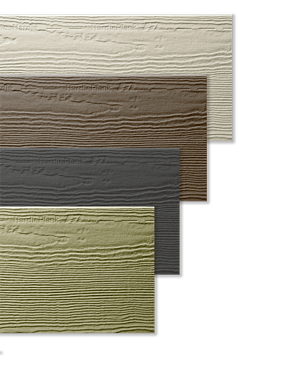 A few companies have begun offering prefinished (i.e., prepainted) fiber cement siding and trim; notably, James Hardie and Plycem’s Allura. These products may represent a viable strategy for reducing the lifecycle impacts of fiber cement products, which do have high embodied energy. The controlled factory environment assures excellent coverage and optimal curing conditions; consequently, siding treated this way may not have to be repainted as quickly as new siding that is painted in the field. James Hardie products treated with the company’s ColorPlus finish (shown above) come with a 15-year limited warranty that covers paint and labor. Multiple coats of a proprietary finish are applied to every surface and edge, and the finish is cured between coats. The finish is available in about two dozen colors; touch-up kits are available for cut edges and nail heads. Allura’s ColorMax finishing system, which includes 22 solid colors and six semi-transparent wood stains, is also backed by a 15-year limited coating warranty. The system consists of a primer/sealer for premium weather protection and machine-applied coats of a 100 percent acrylic coating from PPG Pittsburgh Paints. Allura also offers touch-up kits. Dearborn has seen a migration toward higher-end products in recent years. 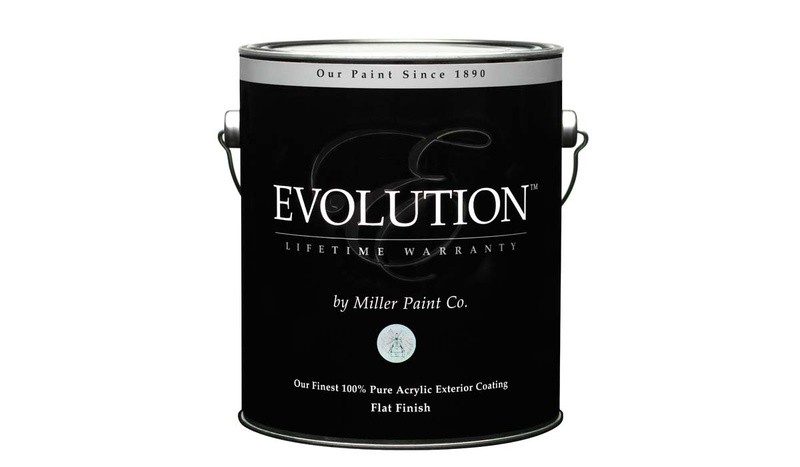 Sales of Evolution, Miller Paint’s highest-end exterior product, have grown by 20 percent over the past two years. In general, better-quality paints contain a higher percentage of solids and a greater proportion of high-quality pigments to cheaper fillers, such as calcium carbonate. They provide better coverage, resist fading and last longer, assuming they were applied properly. Most manufacturers offer several lines of exterior products. 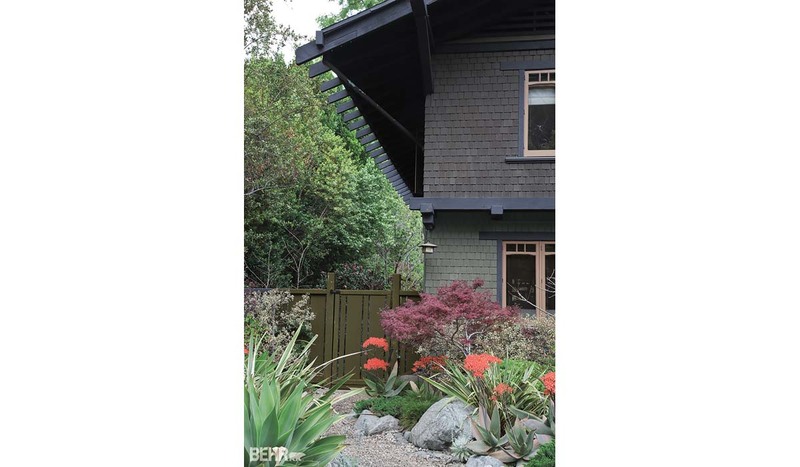 Behr, for example, offers BEHR MARQUEE, PREMIUM PLUS ULTRA and PREMIUM PLUS exterior paints. While each is tailored for a specific purpose, all are formaldehyde free and certified GREENGUARD Gold. MARQUEE, the brand’s top-of-the-line exterior paint, offers the best in durability and performance, along with superior dirt pick-up resistance and early rain resistance. It retails for around $46/gallon. In comparison, BEHR PREMIUM PLUS Paint & Primer in One, which delivers basic primer properties along with a durable finish, costs around $30. Sherwin-Williams also offers several lines of exterior paints. “Emerald Exterior, which was introduced in 2012, is number one overall in terms of durability and performance,” says Watson. “It’s perfect for high-end work, and it offers excellent self-priming application, flow and leveling.” All sheens are less than 50 g/L VOC. 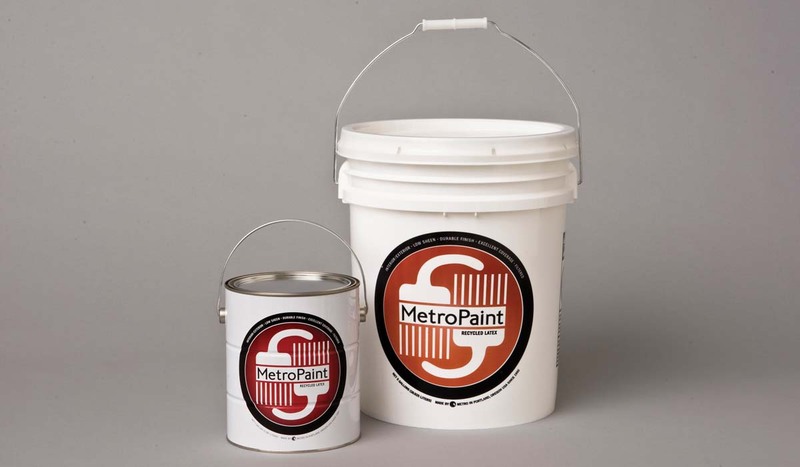 One way to reduce the environmental impact of paint is to use recycled paint. PaintCare is a non-profit organization and project of the American Coatings Association. The organization plans and operates stewardship programs in states that have passed paint recycling regulations. Currently, eight states plus the District of Columbia either have programs in place or plan to launch them this year. Oregon was the first state to pass mandatory paint recycling regulations. Since the start of the state’s program in 2010, PaintCare has helped set 157 drop-off locations. Many are retail stores; others are hazardous household waste collection sites. The program accepts house paint and primers, stains, sealers and clear coatings. The program is funded through fees on each container of architectural paint sold in states with paint stewardship programs. Though fees are set on a state-by-state basis, so far all programs have set the same fees, which range from 35 cents to $1.60 per container, depending on its size. There are many coating choices for wood surfaces in addition to paint. These products protect wood from physical damage, water, UV damage and rot; they also enhance wood’s beauty by adding sheen and, sometimes, color. Most of these products need to be applied more regularly than paint and significantly increase the carbon footprint of wood, which, when left to weather naturally, is a material with extremely low embodied energy. There are two general categories of wood finishing products. Film finishes form a protective hard coating above the grain; penetrating, oil-based finishes soak into the wood. Like paints, wood-finishing products contain resins and a solvent. Traditionally, plant- or insect-based oils were used as resins and thinned with turpentine. Today, resins or binders are often petroleum-based compounds, including acrylics, vinyls, alkyds, cellulosics, epoxies and polyurethanes. Alkyd- and polyurethane-based varnishes are high in VOCs; acrylics are lower. There has also been a resurgence in products that use natural resins as the base. Solvents and/or thinners used in wood finishing products include alcohols, ketones, glycol ethers, petroleum distillates, turpentine and water. 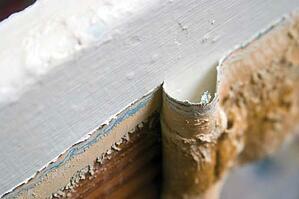 As with paints, a number of manufacturers now offer lower-VOC, water-based alternatives. In general, stains are lower in VOCs and last longer than clear finishes. (According to the Western Red Cedar Lumber Association, solid stains on textured wood need to be reapplied every four to six years; semi-transparent stains every two to four years.) Benjamin Moore offers its ARBORCOAT line of low-VOC waterborne stains and finishes in five opacities. They use the same patented colorant technology as the company’s low-VOC paints, so the total VOC concentration with colorants will not exceed 100 g/L. Penofin Verde is a no-VOC wood stain that is appropriate for both interior and exterior use. As is the case with all Penofin wood-finishing products, its base is Brazilian rosewood oil, which is sustainably harvested from the tree’s pods. It boasts less than 1 gram VOCs/L and 99 percent UV protection. 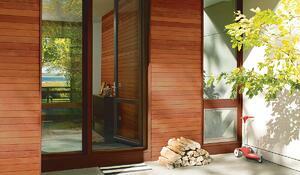 Sansin offers an entire line of Enviro Stains and finishes that are made from tree oils. Modified natural oils and resins are carried deep into the wood’s cell structure, using water as a carrier. As the water evaporates, Sansin bonds directly with the wood substrate, forming a tough, durable barrier that won’t crack, peel or blister. Sansin even offers a recycled product. Eco2 Exterior is a durable, two-coat finish designed for vertical wood surfaces; it is made from recycled Sansin products and is available in four colors. 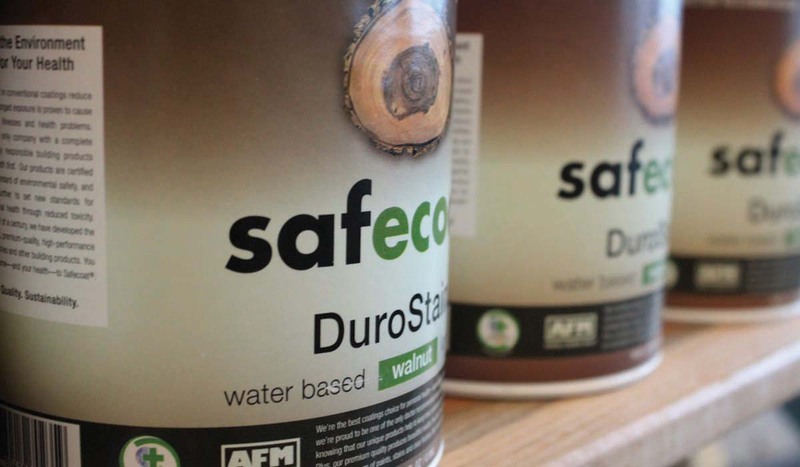 AFM Safecoat does not use formaldehyde in its manufacturing processes or products, and the company offers an entire line of LEED-qualified stains and finishes. Its DuroStain semi-transparent stain is appropriate for all wood surfaces and contains no aniline dyes, gilsonite, aromatic solvents or formaldehyde. Its very low VOC content also meets all federal and state air quality regulations.